The College Prep Outreach Programs operates year round and focuses on promoting student success and post-secondary education through workshops, campus visits and cooperative activities. UNM Campus Visit - The College Prep Programs helps facilitate campus visit for student groups and schools. 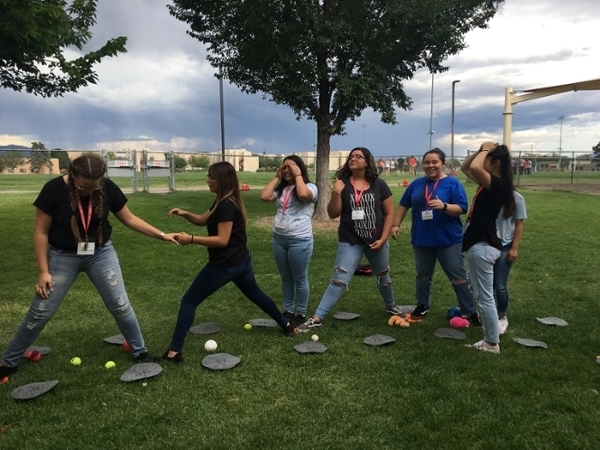 Each visit is planned specifically for the group visiting and can include, campus tours, student panels, cooperative activities, college & career readiness presentations and UNM program presentations. COST: FREE! Cooperative Activities - Cooperative Games or initiative games are used to test a group's ability to communicate with each other, follow directions, and work together to solve a mentally difficult problem. The specific games are chosen depending on the need of the particular group participating and their age level. They often include warm-up activities that develop the basic skills which will be utilized during the activities as well as follow-up conversations, or processing, to allow the group to discuss how the games can be used in future to help the group work better as a team. COST: FREE! College Awareness & Readiness Presentations - The College Prep Programs offers college & career readiness presentations both on and off campus for student groups and schools. Presentations are specifically prepared for each group. Topics include but are not limited to, College 101, Paying for College, Writing Scholarship Essays, Interview Skills and Resume Writing. COST: FREE!